This is an interview with Thomas Lamphere, who will be one of many skilled fly tiers sharing their knowledge of fly tying and fly fishing at the Fly Fishers International Washington Council Fly Fishing Fair in Ellensburg, Washington, May 4th and 5th, 2018. 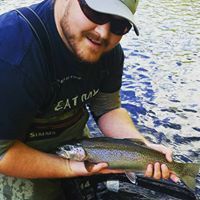 It has been a pleasure to talk to someone in their 20’s who is a gifted fly tier and caster, and very serious about working in the fly fishing industry. I have had an opportunity to watch Thomas tie flies, and cast a long line at the Red Shed Gathering, Spey Casting competition on the Clearwater River in Idaho. I have enjoyed looking at his website and his Facebook page. Thomas and his father Reuben will be a great addition to the Fly Fishing Fair in Ellensburg this May. You don’t want to miss this event. Vern: I understand that you and your Dad Reuben work at the fly material distribution business, Fish Hunter. How many folks work at Fish Hunter? Thomas: It does not have many employees, just my father, Reuben and I, and the owner Jack Moore. Vern: Are you involved with any fly fishing clubs? Thomas: I am a member of Puget Sound Fly Fishers. I am also on the board of directors of Puget Sound Fly Fishers. Vern: What other activities are you doing with regard to Puget Sound Fly Fishers? Thomas: On Wednesdays I host a fly tying teaching session. Vern: What happens at these events? Thomas: On alternating Wednesdays we meet at the Seven Seas Brewery in Gig Harbor, and at the Puget Sound Fly Company alternating weeks. Throughout the year we have around eight to a dozen attend, except during winter when as many as 15 or 16 attend. We start at 6 PM and finish around 8:30-9 PM. There is normally a planned theme each week. If the Club has a planned fishing outing, we may tie flies that will enhance fishing during the outing. Otherwise it may depend on a fishing trip, seasonal hatch like the Mother’s Day Caddis Hatch or March Brown Hatch on the Yakima, or Callibaetis at Lake Chopaka; or a time of the season; for example when fish are spawning, egg patterns, or chum fry patterns for chum migrating out of the gravel and moving downstream to the estuaries. On some nights the theme can be something odd ball, like a Bonefish or Musky fly. I like to keep it interesting. Vern: How did you get into fly fishing? Thomas: I have to give credit to my dad. Fly fishing in the Lamphere family is a tradition. I am a 5th generation fly fisher. I started very young. I got my first fly rod when I was 6 years old. From a very early age we were fly on family camping trips. Vern: When did you start fly tying? Thomas: I received my first fly tying vise when I was 6 years old. Vern: When I first became serious about fly fishing, I joined a fly club. I was fortunate to meet several mentors that encouraged and taught me about fly fishing. Did or do you have any mentors? Thomas: Yes, my main mentor growing up was my Dad, Reuben. He played a big part in getting me interested in fly fishing. Besides my Dad until I entered high school, I also learned from fly fishing, fly casting, and fly tying videos. Overall, my dad was pretty much my main influence in my formative years. As I grew older I fished with my middle school principle and other teachers. Some time, early on in high school I discovered that I was giving back, teaching more than learning. Vern: How long have you been member of Puget Sound Fly Fishers? Thomas: My dad and I have been members around 5-6 years. 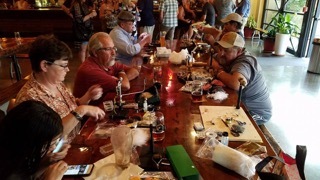 Shortly after we became members we took responsibility for the Wednesday fly tying meet. At first I did it with my dad and then later I took over the responsibility of hosting this event. I have also been spreading the art and craft of fly tying in other ways. Thomas: As a commercial tier I found it quite solitary, especially at night, so I started tying my fly orders at coffee shops . I started doing this about a year after starting the Wednesday night tying session with Puget Sound Fly Fishers. Not all coffee shops allow me to do this, especially some of the big box coffee bistros. I have found some niche coffee shops and small town taverns that allow me to come their to tie. The Jewel Box Cafe on Ressler Way in Tacoma is one of my favorites. 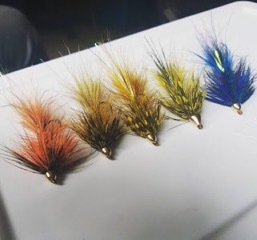 The best part of this is I am not confined to the house, can share my craft, meet people, and on occasion recruit someone for the Wednesday night tying event, or prospective member of the fly club. Vern: Please, tell me about your work history regards to the fly fishing industry? 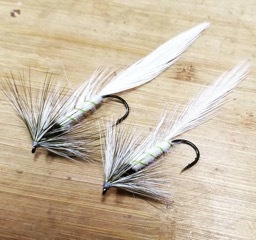 Thomas: I have been commercially tying flies for about 9 1/2 years. I sell to fly shops and special orders for a special trip wholesale and retail shops. Just before I started tying flies commercially, I was playing minor league baseball. It a pitcher who was pitching in the mid 80 mph speed range with a my fastest pitch up to 87 mph. However, I came to the realization that I was competing against pros who pitched in the mid 90’s. I decided to leave a budding career in professional baseball and go all in on fly fishing. At first, I had to support by new found career doing security work, work on a farm, and other odd jobs. Since then my commercial business has grown. In addition, I have worked for Fish Hunter fly material enterprise for almost 5 years. Vern: Have you worked as a fly fishing guide? Thomas: No, not in a formal licensed guide fashion. The guide market is very saturated and the cost for a guide licenses, especially salt water are quite expensive. If I could or ever decide to guide, it will be for Sea-run Cutthroat Trout. Vern: I have seen you participate at the Red Shed Casting Competition? How long have you been competing and where? Thomas: I haven’t done much competitive fly casting. I like the Red Shed competition because it is a friendly competition, no egos and it is more for the fun of competing with fly fishing friends. Folks at the competition are very encouraging. This is my 2nd year at the Red Shed. I enjoy casting the two handed rod, but don’t get to do it as much as I like. Vern: What is your favorite fish to pursue? Thomas: If I had only one fish to fish for it would be the Sea Run Cutthroat. Vern: What are some of your favorite flies for sea run cutthroat? Vern: What type of fly tying do you enjoy? Thomas: I pretty much like to tie everything. On the commercial side, I am tying flies for fishing clients in Colorado, Utah, some really small flies sizes 22/24. I pretty much however like to do it all, from saltwater flies, Anadromous fish, Lingcod, Tarpon, Stripers, flies for Argentina, Peru, and Europe. I am fairly confident that if you give me a pattern, I can tie it. I love the challenge. Vern: What is your vision for this site? Thomas: I am having a lot fun with this site. People are making input. I created a blog with the idea that we can share information, link tying videos to it, and use it in a good way to share stuff without writing a 200 page explanation. We do not hold back on information. For example there is information about using foam flies that my Dad and I are using to catch are sorts of species of fish. These foam flies, boobies, are a fly that is very popular in Europe. It is used in lakes primarily to imitate damsel and dragon fly nymphs, to take big fish. My dad and I have been doing presentations at different venues and clubs. 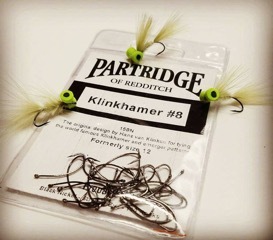 We do one about using these Booby flies along with a lake fishing presentation and the effective use of different sinking lines for different situations. Vern: What other type of fly patterns have you been concentrating on or are patterns that you feature on you website? 2. 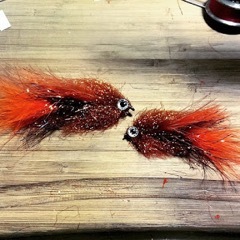 Chum Fry Pattern, another great pattern for Sea Runs. 3. Frozen Sculpin, a pattern for the Puget Sound, as well as for big trout on western Washington waters. 4. Simple Cray, which is a combination of a Barr Meat-whistle meets Crawdad. It is an excellent pattern tied on a jig hook, for trout and bass. Vern: One of the issues in the FFI is the lack of young folks like yourself showing up to our events, and participating in the Federation Flyfisher International. Do you have any suggestion on how we can bring more young people such as yourself into the FFI fly fishing arena? Thomas: Social Media is everything with the younger generation. Fly Fishing and Fly Tying magazines are okay, but even, many of the magazines are going digital. Clubs need to have a social media presence. All events and information on what is going on in the club should be posted on social media. This can improve younger crowd participation. Also, you have to remember that many of those in the “younger generation,” have new families with children and full time jobs, which makes it more difficult to attend meetings. So, they have a choice, a fly fishing trip on the weekend, versus attending a club meeting. I joined Puget Sound Fly Fishers at the age of 22. At that time, I was the youngest member by nearly 20 years. Since then, we are getting more younger folks into the club. What fly clubs need to do is schedule and make available more events. Whether it be fishing, tying flies, rod building or casting classes, or conservation work. The club needs to have value by providing a service to get younger folks in to their meetings. What younger folks shy away from are the clubs were people sit around talking about good old days. That is not where it is at. The clubs need to be active. For example Puget Sound Fly Fisher has 30 outings a year. At their meetings there is a revolving door of new and different speakers, not the same old dudes, giving the same old message. I think clubs to think out of the box and look at doing it different. When it comes to young kids a big part of it with kids, is to keep their attention. Keep them engaged. If possible using a mentor or instructor one on one or one on two in any group class. Vern: Thomas, thank you for your time. I am looking forward to sitting across the table and watch you tie at our Ellensburg Fly Fishing Fair in May. Note from Vern Jeremica, BOD WSCFFI: If you want to find out more about the Fly Fishing Fair, check out: wscffi.org and click on the thumbnail-Fly Fishing Fair.